TUCSON, AZ--(Marketwired - Apr 2, 2014) - On March 29, 2014, staff and family members of Sierra Tucson, a premier treatment center and psychiatric hospital committed to helping people recover from addictions, mental/behavioral disorders, and chronic pain, demonstrated their compassion and joined the community to raise funds and awareness for mental illness through NAMIWalks Southern Arizona. NAMI, the National Alliance on Mental Illness, celebrates its 12th Anniversary and the largest and most successful mental health awareness and fundraising event. 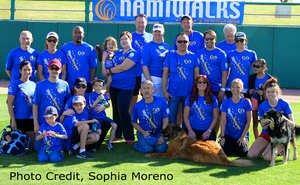 The NAMIWalks' public display of support was established to change how Americans view persons with a mental illness, helping to ensure that assistance and hope are available for those in need, and leading to improved lives and communities. Along with other local companies, organizations, and individuals, Sierra Tucson contributed funds and team participation with 33 staff, spouses, and family members joining in the walk. They chose a team name of "Sierra Tucson Stigma Stompers." Staff participation was coordinated by Elaine Hixson, MC, LPC, Primary Therapist; and Maliea West, BS, Fitness Specialist. "It's great to be a part of something that works so hard to save lives and helps people find recovery and the necessary supports to ameliorate the effects of mental illness and the stigma attached," said Hixson. "I'm happy to see so many people turn out to support the work we do, which we are so passionate about," commented Primary Therapist Kimberly Craig. "It is rewarding to be a part of NAMIWalks," concurred Tom Ostrander, MDiv, MBA, Residential Therapy Manager, "because it is healthy exercise that supports a great cause, I love the camaraderie with the other excited participants, and it is fun to warm up with Zumba before the walk." The NAMI website states that nearly 60 million Americans experience a mental health condition every year. "Regardless of race, age, religion, or economic status, mental illness impacts the lives of at least one in four adults and one in ten children across the United States." This nonprofit organization offers opportunities for people everywhere to donate, speak out, and get involved as an advocate. NAMI provides easy-to-understand information about mental illness, mental health care, diagnosis, treatment, and recovery. Sierra Tucson is celebrating 30 years of compassionate care and clinical excellence. Since its inception, Sierra Tucson has become an international leader in the treatment of complex, co-occurring disorders. As a fully licensed Level 1 Special Hospital and Level 2 Behavioral Health Residential Treatment Center, Sierra Tucson has developed specialized programs for Addictions, Eating Disorders, Mood and Anxiety Disorders, Pain Management, and Trauma/PTSD. An expert staff of full-time medical and clinical professionals utilize an integrative approach to provide neuropsychiatric treatment for emotional, physical, and spiritual healing. Comprehensive individualized treatment plans combine 12-Step philosophy, a wide variety of innovative and integrative therapies, and a dynamic Family Program to support each person's unique capacity for wellness and flourishing. Sierra Tucson has been awarded dual accreditation by The Joint Commission. Located on 160 acres at the foot of the Santa Catalina Mountains near Tucson, Arizona, this exceptional facility offers a beautiful, natural healing environment and the highest level of confidentiality. For more information about Sierra Tucson and its programs, call 800-842-4487.